KARLSRUHE, Germany, April 25, 2018 — Nanopositioning systems developer Physik Instrumente GmbH & Co. KG (PI) has named Thomas Bocher as its marketing segment head for microscopy and life sciences. Stéphane Bussa, vice president of Sales and Marketing, congratulates Thomas Bocher (right) on his appointment as head of Segment Marketing Microscopy and Life Sciences. Courtesy of Physik Instrumente. 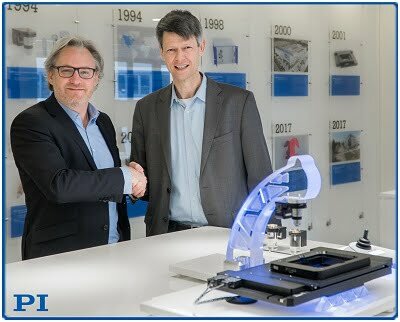 Bocher previously held product and segment manager positions with Carl Zeiss Microscopy GmbH and Bruker BioSpin GmbH. Bocher also served as chairman of the ISO/TC172/SC5 committee for international standardization in the field of light microscopy and endoscopy. PI is a manufacturer of piezo systems, hexapods, and instrumentation for precision motion control.